Italian PM Silvio Berlusconi will not leave hospital until at least Wednesday after being injured in an attack in Milan, his doctor has said. "He'll probably be able to leave hospital on Wednesday," his personal physician Alberto Zangrillo told Italian television. He said that he would have forced the prime minister to take at least 10 days off to recover from the attack, adding that Mr Berlusconi had lost close to half a litre (one pint) of blood. According to a medical bulletin released on Monday, Mr Berlusconi is taking pain killers and antibiotics. His nose is to be reset and he has been given stitches, though he will not need surgery. Mr Zangrillo described Mr Berlusconi as "shaken" and "embittered" following the attack. "As if he had been woken from a bad dream, really disheartened," he was quoted as saying. According to a letter released to Italian news agency, Ansa, Mr Tartaglia has apologised for the attack, writing: "I don't recognise myself," and adding that he had "acted alone [with no] form of militancy or political affiliation". 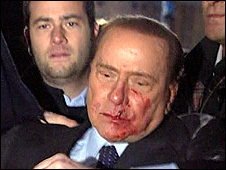 Ansa said Mr Berlusconi had spent a settled night at the San Raffaele hospital after the Sunday evening attack. 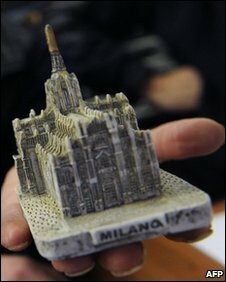 His first request upon waking up in the hospital in Milan was to see some newspapers. 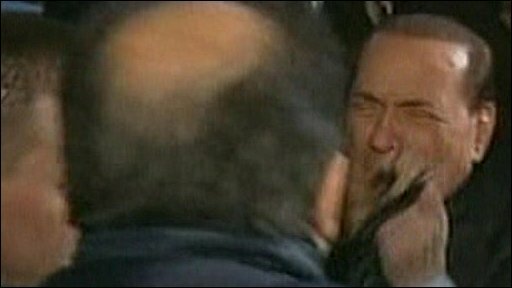 The Italian leader was struck full in the face by the souvenir cathedral while signing autographs. Immediately after the attack, the prime minister - looking dazed - was helped to his feet by aides and put in a car. But he then got out of the car before being driven away. When he arrived at the hospital the prime minister, who face was covered in blood, said he was fine. There are said to have been scuffles between hecklers and security staff during the rally and before the attack. At the hospital, Mr Berlusconi's spokesman, Paolo Bonaiuti said he was worried about the "atmosphere of hatred and violence in the air". The attack on Italy's flamboyant and polarising prime minister has caused deep shock in Italy. A string of politicians and columnists have suggested it reflects the climate of hatred which is dividing the nation, says the BBC's Steve Rosenberg in Milan. The attack was condemned by Italian President Giorgio Napolitano, while conservative Gianfranco Fini said: "This is truly a bad day for Italy, and it's the duty of all the political forces to ensure that Italy does not go back to the years of violence." Umberto Bossi, leader of the far-right Northern League, said what had happened was an "act of terrorism" and called the attack "a worrying sign". But Italy remains divided on the subject of its prime minister, who has been under pressure in recent months, adds our correspondent. His private life has been in the spotlight, amid allegations that he slept with prostitutes, and after his wife filed for divorce. He has dismissed accusations of ties to the Mafia, and criminal cases against him have resumed after a law giving him immunity was overturned. A week ago tens of thousands of people attended an anti-Berlusconi rally in Rome. While some of Mr Berlusconi's supporters have gathered outside the hospital to wish him well, within 24 hours of the attack nearly 70,000 people had signed up to a fan page on social networking site Facebook dedicated to Mr Tartaglia.